Back in the 20s and 30s the Hospital Week was carnival time in Market Lavington and Easterton. It was the time for dressing up and having fun and generally enjoying life. And at the same time money was raised to assist those in need with the cost of health care in those bleak days before there was a National Health Service. This little group are clearly entering into the spirit of things and have themselves suitably attired for all the fun on offer – and to entertain those less able to take an active part. For once, perhaps, it is the man who takes the eye. This chap is dressed as a shell petrol man complete with a magnificent head dress and a suitable can as well as various Shell logos. Sad to say we don’t know who he is and neither do we know the ladies. Any help identifying these people would be gratefully received. The third lady appears to have done something seen as ‘non PC’ these days. It looks as though she has blacked up or at least darkened her facial skin. The location is interesting for these people are by the Easterton pump which still stands on Kings Road, close by the bridge. This clearly shows the chute for delivering water into a bowser. Farmers brought mobile water carriers or bowsers to the pump for filling. This helps to explain why the pump was built on quite a high stand. Arthur Oatley was born in Streatham in South London in 1883. Sometime towards the end of the 19th century his father became manager of Market Lavington brickworks. In 1901 young Arthur was living at Broadway in the rather lovely brick manager’s house. He was working as a brick dryer. By 1911 Arthur was married and had two little children. He was a builder living in Littleton Panell. Clearly by the 1920s Arthur had his business in Market Lavington at The Market House – the one old house still standing in the market place. It has recently been modernised internally and much renovated. This bill was for sheets of asbestos which of course we now consider a very dangerous product. It was seen as a wonder material in past times. The Oatleys were active in the village. Arthur was a member of the Market Lavington Prize Silver Band. His wife May was church organist. We have a photo of daughter, Rita, involved in a carnival. We believed they actually lived in the Townsend area of Market Lavington. Until we were given this bill, we knew nothing of the business and we know almost nothing of the family. Perhaps somebody could tell us some more. Good fortune continues at Market Lavington Museum so today we’ll take a look at what might be called the Holloway haul of acquisitions. These were documents saved from the Holloway builders’ office at some point in the past. 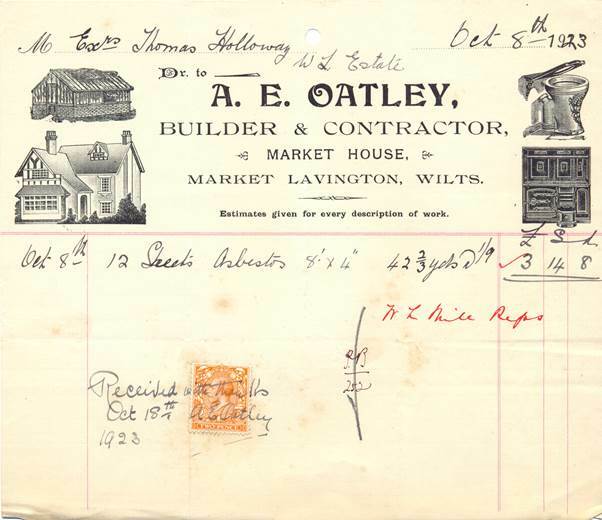 Holloways were a West Lavington firm but they traded with Market Lavington and Easterton people and of course, it is these documents that concern us. Actually, and quite understandably, the owner wishes to keep the majority of his original documents. He has loaned them to the museum for copying. This, of course, is something easily done with photos and paper documents. 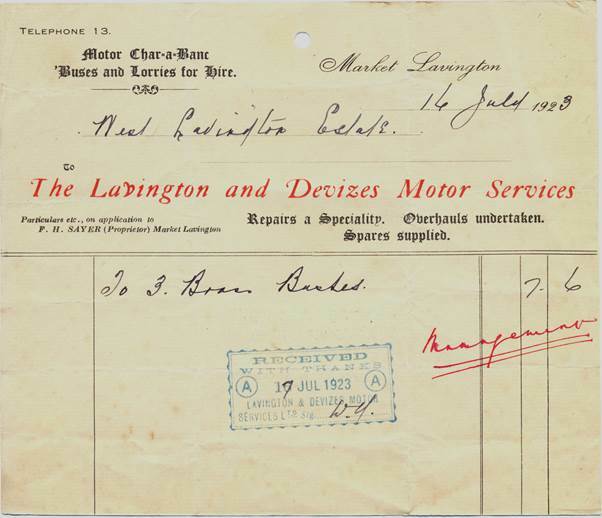 What we look at today is a bill from Lavington and Devizes Motor Services. So what information can we glean from this? I suppose first we can say that each brass bush cost half a crown (12½p in present money). I’m afraid we don’t know what the bushes were used for but presumably it was to assist in the smooth running of a vehicle or piece of machinery. We can see that at the time of this bill (July 1923) the telephone had arrived and the local bus company had phone 13. The proprietor was, of course, Mr F H Sayer who we have met before on this blog (click here). We can see that the bus company had motor char-a-banc, buses or lorries for hire. We believe they were adept at removing one body from a vehicle chassis and replacing it with another according to need. And we can see they ran a motor repair business doing repairs, overhauls and supplying spares. We can also see that Mr Holloway was a very prompt payer on this occasion. The bill was raised on the 14th July and settled on the 17th. For us at the museum it is just lovely to have a record of what must have been day to day activity in the village more than 90 years ago. 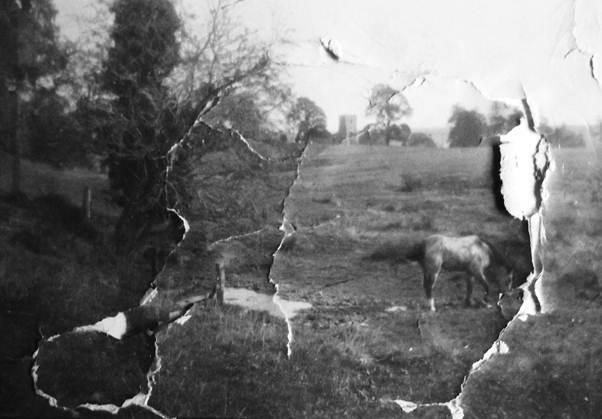 This photo, not in tip-top condition, dates from 1923 so it is 90 years old. The hole in the photo is easily fixed digitally. And we think the sepia colour is due to fading so we have returned the photo to monochrome black and white. We are looking at what some of us think of as ‘the last homely house’ for this is the highest dwelling now remaining up Lavington Hill. There used to be a limekiln higher up and that created The Hollow. This Hollow resulted from quarrying. 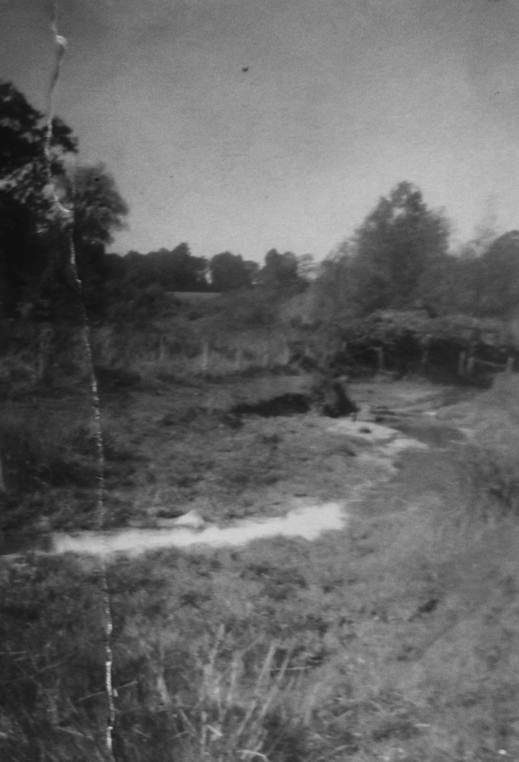 We can see a track leading down into The Hollow to the right of the cottages. We can just make out the church in Market Lavington above the chimney on the cottages. This photo has a transatlantic history. It was taken in 1923 by Mrs Maude Wright and must have travelled with her to Canada for she sent it to Peggy Gye from across the Atlantic, to be a part of our museum collection. We are going to see, today, a couple of photos showing ‘The Grove’ in Market Lavington. The photos are certainly not brilliant in quality or condition. Here’s the first – it could be almost anywhere. 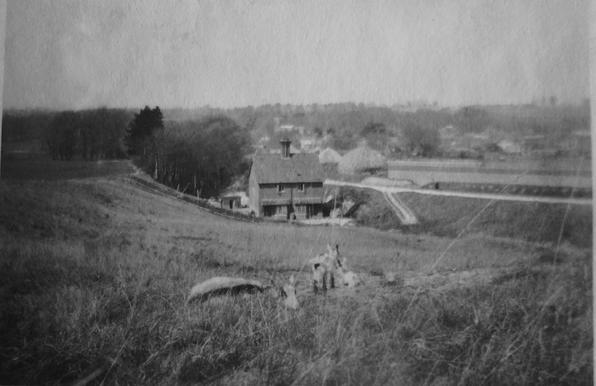 The Grove, Market Lavington in 1923 = not the most exciting photo! 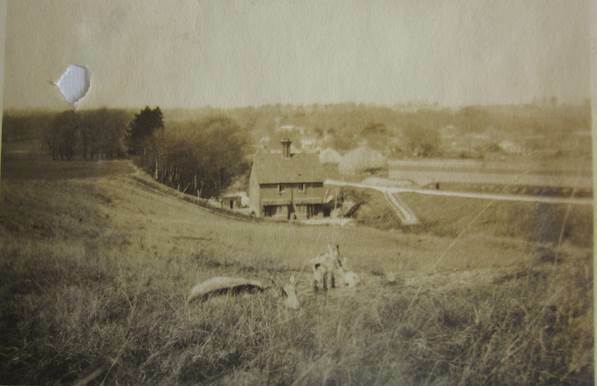 The Grove showing St Mary’s church, market Lavington in 1923. AShame about the photo condition! 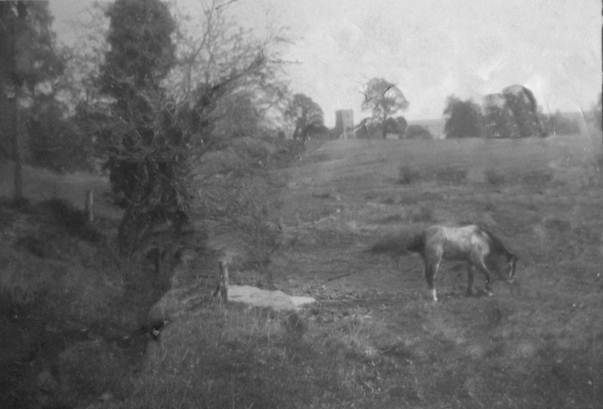 This one is in shocking condition but at least has St Mary’s Church visible and a grazing horse. We have some information about these images. They are dated as 1923. The pictures were taken by Maude Wright who emigrated to Canada and married there. She sent these pictures to Peggy Gye prior to 1985. The question for us, which we hope someone can answer, is ‘who was Maude Wright?’ We know nothing at all about her. We do not know if Maude Wright was her married or her maiden name. We don’t know when she emigrated – but presumably after 1923. Do get in touch if you can tell us anything. Let’s finish with a ten minute digital clean up of that second photo. Ten minute’s work at improving the photo with Market Lavington Church.